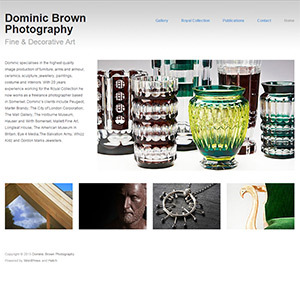 Dominic specialises in the highest quality image production of furniture, sculpture, jewellery, paintings, costume and interiors. With 20 years experience working for the Royal Collection he now works as a freelance photographer based in Somerset. Dominic’s clients include Peugeot, Martel Brandy, The City of London Corporation, The Mall Gallery, The Holburne Museum, Hauser and Wirth Somerset, Mallett Fine Art, Longleat House, The American Museum in Britain. We built a Wordpress site and made a clean theme to present his work in a clear and uncluttered way. 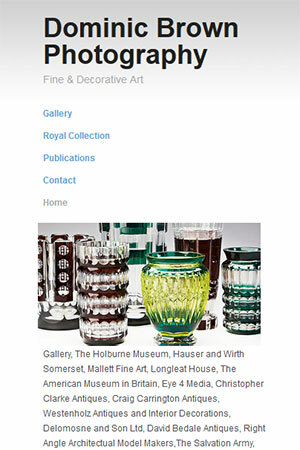 The site uses a gallery plugin that features thumbnail previews.
" Working with James at Fat Graphics has been a real pleasure.The very professional and creative approach he has taken to rebuilding my website has meant I have everything in it to reflect my core and growing business."